Immunoglobulin G4-related disease (IgG4-RD) is an inflammatory disease of unknown etiology, characterized by IgG4-immunopositive lymphoplasmacytic infiltration, and mass-like nodular enlargement in affecting organ. The concept of IgG4-RD was based on studies regarding autoimmune pancreatitis. In 2001, elevation of serum IgG4 in autoimmune pancreatitis was first introduced by Hamano et al. Kamisawa et al. further confirmed IgG4-immonopositive plasma cell infiltration in peripancreatic tissue of autoimmune pancreatitis in 2003, and proposed a new disease entity of IgG4-related autoimmune disease. IgG4-RD had been reported in one or more organs, simultaneously or subsequently, including pancreas, hepatobiliary tract, lung, kidneys, retroperitoneum, lymph nodes, submandibular and parotid glands, and ocular adnexa. In cases of ocular adnexal involvement, IgG4-related ophthalmic disease (IgG4-ROD) is recommended as the disease term. In the past decade, increasing evidence suggest IgG4-ROD had unique clinicohistopathological features. Besides, Mikulicz's disease and part idiopathic orbital inflammations were now regarding as IgG4-ROD. In this review, we discuss the most recent published evidence regarding the clinicohistological backgrounds as well as update management of IgG4-ROD. Meanwhile, a recent Japanese prevalence study of IgG4-ROD (n = 1014) showed that approximately a quarter of orbital lymphoproliferative disorders are related to IgG4. It provided us a hint of how common IgG4-ROD might be. Histopathology is essential for the diagnosis of IgG4-RD. Morphologically, three major histopathological features associated with IgG4-RD are dense lymphoplasmacytic infiltrate, storiform fibrosis, and obliterative phlebitis. Although the histological appearance is similar for all organs, variability of different findings in certain organs was noteworthy. For IgG4-ROD, dense lymphoplasmacytic infiltrate was typically presented with some collagenous fibrosis, but obliterative phlebilits were relatively uncommon. IgG4 immunostaining plays a key role in the diagnosis of IgG4-RD, even when serum IgG4 level is within normal limits. The finding of IgG4-positve lymphoplasmacytic infiltration is helpful in differentiating IgG-ROD from other lymphoplasmacytic disorders, such as idiopathic orbital inflammation and lymphoma. There is no standard approach or cutoff value for counting IgG4+ plasma cell. An IgG4+ plasma cell count per high-power field (HPF) varies largely in different affected organs, reporting from 10 to 200 per HPF. Therefore, some researchers had suggested an IgG4+/IgG plasma cell ratio >40% as a general cutoff value in any affecting organs.,, For IgG4-ROD, combined IgG4+ plasma cell counts with IgG4+/IgG plasma cell ratio is helpful for diagnosis. The comprehensive diagnostic criteria of IgG4-RD [Table 1] were first introduced in 2011, which was a minimal consensus criterion to aid general practitioners in the clinical diagnosis of IgG4-RD. The basic concept is to categorize the diagnoses of IgG4-RD into three levels (possible, probable, or definite) by three major criteria (clinical manifestation, elevated serum IgG4, and histopathologic evidence). However, the diagnostic criteria for individual organs are not well established, such as lung, salivary gland, and orbital adnexa. Meanwhile, emerging studies showed that IgG4-ROD had unique and uniform clinicopathological features, which indicated the necessity of specific diagnostic criteria for eye. In the background, the Study Group for IgG4-RD granted from Japanese government drafted the diagnostic criteria for IgG4-ROD in 2014 [Table 2]. Basically, the diagnostic criteria are based on the framework of the comprehensive diagnostic criteria for IgG4-RD 2011. These two criteria differ in several aspects. First, the various ocular tissues involved in IgG4-ROD were described based on image studies, which included the enlargement of lacrimal gland (LG), trigeminal nerve, extraocular muscles (EOMs), or any hypertrophic ophthalmic lesions. Second, fibrosis is not necessarily emphasized histopathologically in IgG4-ROD. Third, the criteria for an IgG4-positive plasma cell infiltrate of IgG4-ROD are a ratio of IgG4-positive cells to IgG-positive cells at least 40% or 50 cells/HPF (×400). Typical IgG4-ROD presented as painless enlarging masses over LG with or without proptosis [Figure 1]. Bilateral disease is common but not necessarily symmetrical. Visual acuity is usually not impaired, but optic nerve compression causing blindness has been reported. Besides lacrimal gland, IgG4-ROD has also been reported in various orbit tissues, including muscle, fat, eyelid, and nerve. Ninety-five patients from seven IgG4-ROD studies were reviewed, and their clinical features were summarized in [Table 3].,,,,,, Bilateral involvement of IgG4-ROD was found in 62% of patients. For locations affected by IgG4-ROD, LG was the most common (84%), followed by orbital cavity (19%), EOMs (19%), and nerve (7%). The vast majority of patients (95%) had elevated serum IgG4 concentration more than 135 mg/dL at diagnosis. Besides, IgG4-ROD with systemic involvement was noted in 58% of patients. Disease relapsing after treatment was 29%. The diagnostic value of serum Ig4 level for IgG4-RD had been reviewed in a meta-analysis study, and it showed that serum IgG4 level is a modestly effective marker to screen IgG4-RD with good sensitivity (87.2%) and specificity (82.6%). However, elevated serum IgG4 concentration alone is neither sufficiently sensitive nor specific for diagnosis. About 5% [Table 3] of patients with IgG4-ROD have normal serum IgG4 concentrations at presentation. Histopathology examination is warranted for suspected IgG4-ROD presented with normal serum IgG4 level. Serial change of serum IgG4 levels is useful in the assessment of disease activity in most patients with IgG4-ROD. Most patients with IgG4-ROD responded well to steroid therapy, which was accompanied by a marked decrease in serum IgG4.,, However, patients with serum IgG4 levels that remain elevated after steroid treatment should be carefully observed for relapse. Although the degree of IgG4 elevation correlates imperfectly with the degree of disease activity, it is often a useful parameter to follow in individual patients. Imaging by computed tomography (CT) and/or magnetic resonance imaging (MRI) is important for diagnosing orbital lymphoproliferative disorders, including IgG4-ROD. Both CT and MRI can identify the tumor-like enlargements of affected tissue in IgG4-ROD. However, to differentiate IgG4-ROD from other orbital lesion by image study is difficult, mainly because of little understating of imaging features of IgG4-ROD. Ohshima et al. first reported the infraorbital nerve enlargement (IONE) on MRI imaging is highly correlated to the clinical diagnosis of IgG4-ROD. Meanwhile, Sogabe et al. reported the pathological finding of IONE in IgG4-ROD is due to IgG4-RD involving the epineurium. Their studies highlight the significance of trigeminal nerve branch involvement of IgG4-ROD. Sogabe et al. further reviewed the radiological images and clinical records of 65 patients with IgG4-ROD collected from seven institutions in Japan. The frequent locations of IgG4-ROD are LG (87.7%), followed by trigeminal nerve branch enlargement (38.5%), EOMs (24.6%), orbital fat (23.1%), eyelid (12.3%), and nasolacrimal duct (1.5%). There is no randomized control study for the treatments of IgG4-ROD up-to-date. The optimal treatment for IgG4-ROD has not been established. Current consensus on IgG4-ROD treatment is based on clinical observation studies and case series on IgG4-RD. Glucocorticoids are the first-line treatment for most patients with IgG4-ROD. Common approach to the treatment IgG4-ROD with systemic corticosteroid was initiated orally with prednisolone 0.6 mg/kg/day for 2–4 weeks and then tapered by 5 mg every 2–4 weeks., It generally took 3–6 months to discontinue steroid treatment. The vast majority of patients with IgG4-ROD respond well to glucocorticoids within weeks, typically with reductions in the size of masses, improvements of symptoms, and often a marked decrease in serum IgG4. For those who respond poorly to glucocorticoids may include patients with more fibrotic changes and chronic stage. IgG4-ROD presented with low serum IgG4 level had been reported as a poor prognostic factor for glucocorticoids treatment. Despite an overall good response to glucocorticoids treatment, the recurrence of IgG4-ROD during follow-ups was not uncommon. The relapse rate of IgG4-ROD had been reported from 17% to 50%. For recurrent IgG4-ROD, retreatment with glucocorticoids is often indicated, and certain patients benefit from maintenance therapy. Besides, intraorbital injection of glucocorticoids had been reported as an alternative treatment approach for IgG4-ROD centered in anterior orbit to avoid systemic immunosuppression. However, the need of repeat injections due to incomplete response and disease relapse may limit its clinical value. Rituximab, a monoclonal CD20 antibody, had been increasingly involved in treating in a variety of conditions, including non-Hodgkin lymphomas, chronic lymphocytic leukemia, rheumatoid diseases, and IgG4-RD., Carruthers et al. conducted a prospective and open-label trial (n = 30) to evaluate the efficacy of rituximab in treating IgG4-RD, and 97% of participants had excellent response. Rituximab typically reserved as a second-line therapy because of high cost and potential side effects. Recently, the efficacy of B-cell depletion with rituximab in treating IgG4-ROD had been studied. Wu et al. reported five cases of steroid-dependant or steroid-resistant IgG4-ROD successfully managed with rituximab therapy alone without relapse for a mean follow-up of 33 months. Although promising results of rituximab on treating IgG4-ROD had been supported, further randomized control trial is warranted due to limit of case number in the previous reports. In patients refractory to glucocorticoids or unable to have their dose reduced sufficiently to avoid adverse effects of the long-term use, rituximab should be considered. There are only few case report and series mentioned about radiation therapy in IgG4-ROD. The use of radiotherapy is supported by its effectiveness in treating a variety of orbital diseases, including reactive lymphoid hyperplasia, lymphoma, thyroid eye disease, and orbital pseudotumor. Radiation therapy with 2000 cGy in multiple fractions was commonly used in the literature. Of the 8 patients in the Sato et al. study treated initially with radiation therapy alone, 5 achieved complete remission, 1 achieved partial remission, and 2 relapsed. Chen et al. described a successful medical orbital decompression with adjunctive rituximab and radiation therapy for severe visual loss in IgG4-ROD with acute compressive optic neuropathy. Lin et al. demonstrated a favorable response to adjunctive radiotherapy with the improvement of the clinical symptoms and radiologic abnormalities in three patients with refractory ocular adnexal IgG4-RD or intolerant to corticosteroid therapy. The current role of radiation therapy in IgG4-ROD is mainly adjunctive to systemic medical treatment. Studies are warranted to provide more information about the precise role of adjunctive orbital radiotherapy on the ocular adnexal IgG4-RD. Increased risk of malignancies in IgG4-RD was reported in one study in Japan. Although a case of bilateral IgG4-ROD evolving into mucosa-associated lymphoid tissue (MALT) lymphoma had been reported, it is not certain whether IgG4-ROD predisposes to the development of ocular IgG4 MALT lymphomas. Emerging studies have showed a positive association between IgG4-ROD and IgG4 MALT lymphoma. First, monoclonal IgG4 expression on Southern blot hybridization was found in 2 cases among 21 cases of IgG4-ROD in Sato et al. study, which suggested that IgG4 MALT lymphomas may arise from a background of IgG4-related chronic inflammation. Second, by comparing the clinicohistological features of ocular IgG4 MALT lymphoma, ocular non-IgG4 MALT lymphoma, and IgG4-ROD, Kubota et al. reported a significant overlap between ocular IgG4 MALT lymphoma and IgG4-ROD in serology and histology. Third, by analyzing mRNA expression of cytokines among ocular IgG4 MALT lymphoma, ocular non-IgG4 MALT lymphoma, and IgG4-ROD, Ohno et al. suggests a subset of ocular MALT lymphomas may arise in association with IgG4-RD. Further studies are warranted for understanding the relationship between IgG4-ROD and IgG4 MALT lymphoma. IgG4-ROD represents a significant proportion of what has previously been considered as idiopathic orbital inflammation or reactive lymphoid hyperplasia. Careful clinicoradiologic examination, investigation for other organ involvement, and long-term monitoring for disease relapse or potential neoplastic transformation should be required for patients with IgG4-ROD. Zen Y, Inoue D, Kitao A, Onodera M, Abo H, Miyayama S, et al. IgG4-related lung and pleural disease: A clinicopathologic study of 21 cases. Am J Surg Pathol 2009;33:1886-93. Cornell LD, Chicano SL, Deshpande V, Collins AB, Selig MK, Lauwers GY, et al. Pseudotumors due to IgG4 immune-complex tubulointerstitial nephritis associated with autoimmune pancreatocentric disease. Am J Surg Pathol 2007;31:1586-97. Zen Y, Onodera M, Inoue D, Kitao A, Matsui O, Nohara T, et al. Retroperitoneal fibrosis: A clinicopathologic study with respect to immunoglobulin G4. Am J Surg Pathol 2009;33:1833-9. Cheuk W, Yuen HK, Chu SY, Chiu EK, Lam LK, Chan JK. Lymphadenopathy of IgG4-related sclerosing disease. Am J Surg Pathol 2008;32:671-81. Kitagawa S, Zen Y, Harada K, Sasaki M, Sato Y, Minato H, et al. Abundant IgG4-positive plasma cell infiltration characterizes chronic sclerosing sialadenitis (Küttner's tumor). Am J Surg Pathol 2005;29:783-91. Yu WK, Kao SC, Yang CF, Lee FL, Tsai CC. Ocular adnexal IgG4-related disease: Clinical features, outcome, and factors associated with response to systemic steroids. Jpn J Ophthalmol 2015;59:8-13. Sato Y, Ohshima K, Ichimura K, Sato M, Yamadori I, Tanaka T, et al. Ocular adnexal IgG4-related disease has uniform clinicopathology. Pathol Int 2008;58:465-70. McNab AA, McKelvie P. IgG4-related ophthalmic disease. Part I: Background and pathology. Ophthal Plast Reconstr Surg 2015;31:83-8. Takahira M, Kawano M, Zen Y, Minato H, Yamada K, Sugiyama K. IgG4-related chronic sclerosing dacryoadenitis. Arch Ophthalmol 2007;125:1575-8. Kubota T, Moritani S, Katayama M, Terasaki H. Ocular adnexal IgG4-related lymphoplasmacytic infiltrative disorder. Arch Ophthalmol 2010;128:577-84. Takahira M, Ozawa Y, Kawano M, Zen Y, Hamaoka S, Yamada K, et al. Clinical aspects of IgG4-related orbital inflammation in a case series of ocular adnexal lymphoproliferative disorders. Int J Rheumatol 2012;2012:635473. Koizumi S, Kamisawa T, Kuruma S, Tabata T, Iwasaki S, Chiba K, et al. Clinical features of IgG4-related dacryoadenitis. Graefes Arch Clin Exp Ophthalmol 2014;252:491-7. Go H, Kim JE, Kim YA, Chung HK, Khwarg SI, Kim CW, et al. Ocular adnexal IgG4-related disease: Comparative analysis with mucosa-associated lymphoid tissue lymphoma and other chronic inflammatory conditions. Histopathology 2012;60:296-312. Plaza JA, Garrity JA, Dogan A, Ananthamurthy A, Witzig TE, Salomão DR. Orbital inflammation with IgG4-positive plasma cells: Manifestation of IgG4 systemic disease. Arch Ophthalmol 2011;129:421-8. Kanno A, Masamune A, Okazaki K, Kamisawa T, Kawa S, Nishimori I, et al. Nationwide epidemiological survey of autoimmune pancreatitis in Japan in 2011. Pancreas 2015;44:535-9. Griepentrog GJ, Vickers RW, Karesh JW, Azari AA, Albert DM, Bukat CN. A clinicopathologic case study of two patients with pediatric orbital IgG4-related disease. Orbit 2013;32:389-91. Kalapesi FB, Garrott HM, Moldovan C, Williams M, Ramanan A, Herbert HM. IgG4 orbital inflammation in a 5-year-old child presenting as an orbital mass. Orbit 2013;32:137-40. Deshpande V, Zen Y, Chan JK, Yi EE, Sato Y, Yoshino T, et al. Consensus statement on the pathology of IgG4-related disease. Mod Pathol 2012;25:1181-92. Sato Y, Kojima M, Takata K, Morito T, Asaoku H, Takeuchi T, et al. Systemic IgG4-related lymphadenopathy: A clinical and pathologic comparison to multicentric Castleman's disease. Mod Pathol 2009;22:589-99. Cheuk W, Chan JK. IgG4-related sclerosing disease: A critical appraisal of an evolving clinicopathologic entity. Adv Anat Pathol 2010;17:303-32. Umehara H, Okazaki K, Masaki Y, Kawano M, Yamamoto M, Saeki T, et al. 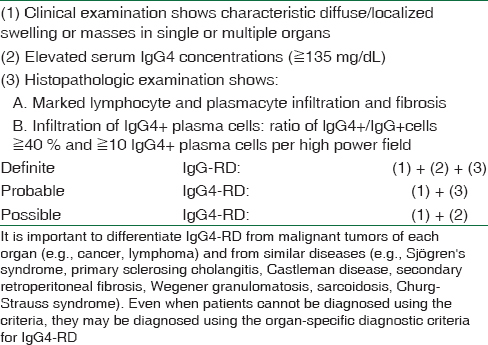 Comprehensive diagnostic criteria for IgG4-related disease (IgG4-RD), 2011. Mod Rheumatol 2012;22:21-30. Goto H, Takahira M, Azumi A; Japanese Study Group for IgG-Related Ophthalmic Disease. 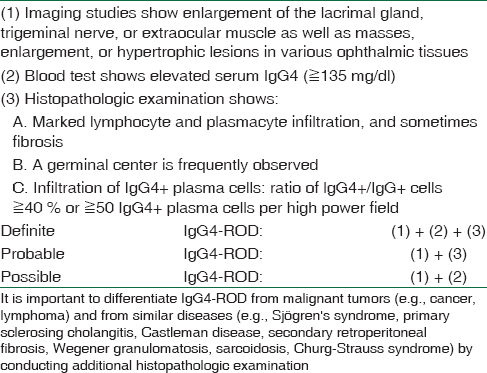 Erratum to: Diagnostic criteria for IgG4-related ophthalmic disease. Jpn J Ophthalmol 2015;59:201. Cheuk W, Yuen HK, Chan JK. Chronic sclerosing dacryoadenitis: Part of the spectrum of IgG4-related sclerosing disease? Am J Surg Pathol 2007;31:643-5. Hao M, Liu M, Fan G, Yang X, Li J. Diagnostic value of serum IgG4 for IgG4-related disease: A PRISMA-compliant systematic review and meta-analysis. Medicine (Baltimore) 2016;95:e3785. Hagiya C, Tsuboi H, Yokosawa M, Hagiwara S, Hirota T, Takai C, et al. 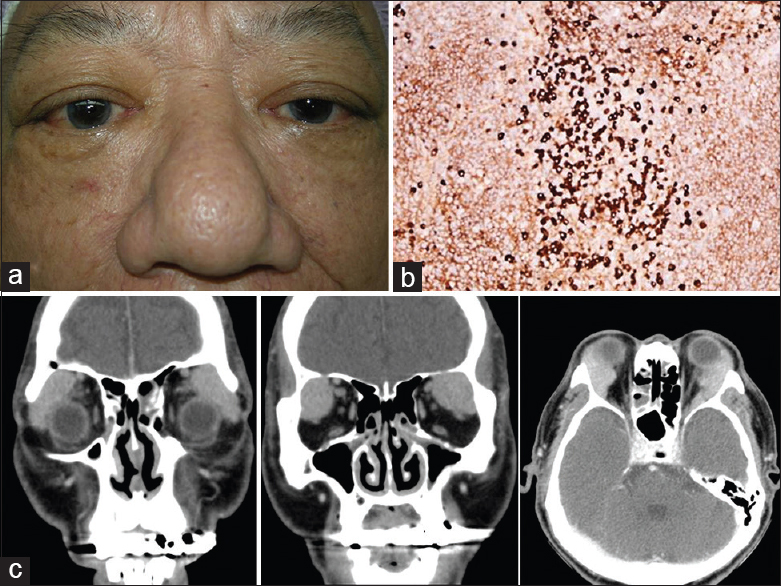 Clinicopathological features of IgG4-related disease complicated with orbital involvement. Mod Rheumatol 2014;24:471-6. Woo YJ, Kim JW, Yoon JS. Clinical implications of serum IgG4 levels in patients with IgG4-related ophthalmic disease. Br J Ophthalmol 2016. pii: Bjophthalmol-2016-308592. Ohshima K, Sogabe Y, Sato Y. The usefulness of infraorbital nerve enlargement on MRI imaging in clinical diagnosis of IgG4-related orbital disease. Jpn J Ophthalmol 2012;56:380-2. Sogabe Y, Miyatani K, Goto R, Ishii G, Ohshima K, Sato Y. Pathological findings of infraorbital nerve enlargement in IgG4-related ophthalmic disease. Jpn J Ophthalmol 2012;56:511-4. Sogabe Y, Ohshima K, Azumi A, Takahira M, Kase S, Tsuji H, et al. Location and frequency of lesions in patients with IgG4-related ophthalmic diseases. Graefes Arch Clin Exp Ophthalmol 2014;252:531-8. Andrew NH, Gajdatsy A, Selva D. Intraorbital corticosteroid injection for the treatment of IgG4-related ophthalmic disease. Br J Ophthalmol 2016;100:644-7. Carruthers MN, Topazian MD, Khosroshahi A, Witzig TE, Wallace ZS, Hart PA, et al. Rituximab for IgG4-related disease: A prospective, open-label trial. Ann Rheum Dis 2015;74:1171-7. Wu A, Andrew NH, Tsirbas A, Tan P, Gajdatsy A, Selva D. Rituximab for the treatment of IgG4-related orbital disease: Experience from five cases. Eye (Lond) 2015;29:122-8. Chen TS, Figueira E, Lau OC, McKelvie PA, Smee RI, Dawes LC, et al. Successful “medical” orbital decompression with adjunctive rituximab for severe visual loss in IgG4-related orbital inflammatory disease with orbital myositis. Ophthal Plast Reconstr Surg 2014;30:e122-5. Lin YH, Yen SH, Tsai CC, Kao SC, Lee FL. Adjunctive orbital radiotherapy for ocular adnexal IgG4-related disease: Preliminary experience in patients refractory or intolerant to corticosteroid therapy. Ocul Immunol Inflamm 2015;23:162-7. Yamamoto M, Takahashi H, Tabeya T, Suzuki C, Naishiro Y, Ishigami K, et al. Risk of malignancies in IgG4-related disease. Mod Rheumatol 2012;22:414-8. Mulay K, Aggarwal E. IgG4-related dacryoadenitis evolving into an extra-nodal, marginal zone B-cell lymphoma (EMZL): A tale of two lacrimal glands. Pathology 2014;46:464-6.